Preheat oven to 400° F. Grease six 8-ounce oven proof ramekins (or eight 6-ounce ramekins) and sprinkle with sugar. Spoon equal portions of frozen Wild Blueberries into ramekins. Coarsely chop ½ cup of walnuts. Grind remaining 1 cup in food processor. Add flour, sugar, and salt to ground nuts. Pulse to mix. Heat butter in large sauce pan until golden brown. Remove from heat. Whisk in eggs, milk and vanilla. Fold in flour mixture. 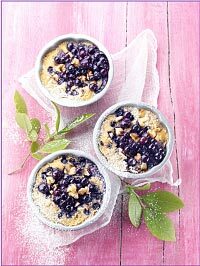 Spoon mixture over Wild Blueberries and sprinkle with chopped walnuts.